The American West has been good to Joel and Ethan Coen. Their debut, Blood Simple (1984), made expressive use of its Texas setting, and they achieved more recent critical and commercial success with No Country for Old Men (2007). True Grit - their most profitable and prestigious movie to date ($162 million domestic gross and 10 Oscar nominations) - seems to confirm this happy relationship. It is, however, their first film to be set in the Old West of the 19th Century, as seen in most Western movies. To genre snobs like me, then, it is their first “proper” Western. It is also a remake of a 1969 film starring John Wayne. I talk more about the relationship between the two versions in the Alternate Take, but here I want to consider the Coens’ True Grit on its own merits, as one of the more interesting and successful Westerns in recent years. 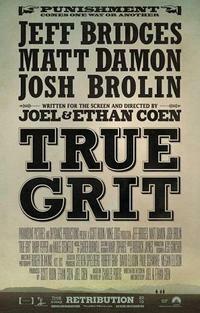 True Grit tells the story of Mattie Ross (Hailee Steinfeld), a mature, rather serious teenage girl, who hires U.S. Marshal Rooster Cogburn (Jeff Bridges) to help her catch her father’s killer, Tom Chaney (Josh Brolin). The cast brings together performers from the better Western-style movies of the past few years. As well as Bridges, who won an Oscar for Country and Western drama Crazy Heart (2009), and Brolin, from No Country for Old Men, there is Barry Pepper, from The Three Burials of Melquiades Estrada (2005), playing bandit Lucky Ned Pepper. This creates the sense that the film is condensing some of the more effective elements from recent portrayals of the West. Alongside these familiar figures, Steinfeld (who, astonishingly, is 14 years old) is able to express the wonder and apprehension of an outsider. Her solemn but cheeky performance is one of the highlights of the film. For a long time, audiences could see the Old West on their screens as often as they cared to. Today, Westerns are rare and the world that they depict seems strange and remote - a vision of the distant past, a fading corner of popular memory. Recent filmmakers have struggled to present this world in a way that audiences will accept and understand. The Coens make a virtue of necessity and embrace this perceived strangeness. The West that they offer us in True Grit is stylised and surreal, drained of colour like the Depression-era South of O Brother, Where Art Thou? (2000). The movie announces itself as a Gothic fable by opening with a Bible quotation and a Sunday School piano version of ‘Leaning on the Everlasting Arms’ (recalling The Night of the Hunter ). At times, the visual style is reminiscent of Tim Burton (before the rot set in), particularly in its expressively artificial use of snow. This approach allows the Coens to integrate their love of eccentric, exaggerated details into a Western. This mostly works well - outlandish touches like Ned Pepper’s wooly chaps and the grotesque, bearskin-clad dentist that Mattie and Rooster encounter enrich the world of the movie with their evocative weirdness. Less successful, however, are the bizarre accents/speech impediments that most of the major male characters have, which seem like a typical Coen joke taken too far. This is also a problem with the grizzled, cantankerous Rooster Cogburn (Bridges), a character who is stylised to the point of inertness. His presentation is so extreme that the film has difficulty providing any believable interaction between him and Mattie, leaving its central relationship underdeveloped. John Wayne won his only Oscar for playing Cogburn in the 1969 version, but in order to endear the Duke to the Academy his persona had to be turned into a performance. To make his acting more visible, he slurred his speech and bobbed his head and lost considerable subtlety in the process. Bridges faces a similar problem - much of his laid-back charm is lost amid the growling and grimacing. But if Cogburn is something of a curiosity, he is still a likeable one, an affectionate caricature of a grouchy old lawman. Considering the kind of material that the Coens are working with, it is an impressive achievement that True Grit manages to avoid being either dour or arch. It has its flaws, but remains a finely balanced and intelligent movie. This review was published on February 21, 2011.